How Does The High Frequency Facial Work? Why Do Wattage & Oscillation Rates Matter? Are High Frequency Facials Considered Safe? High frequency facial machines and devices (traditionally referred to as "violet rays") vary in design and appearance however the underlying principle, technology, and operational functions are virtually the same. Most professional high frequency machines used in spas, salons and medical offices operate at a frequency of 100,000-2500,000+ Hertz (cycles per second). Compact versions of the technology may be purchased by professionals and home users experienced in the application of high frequency. 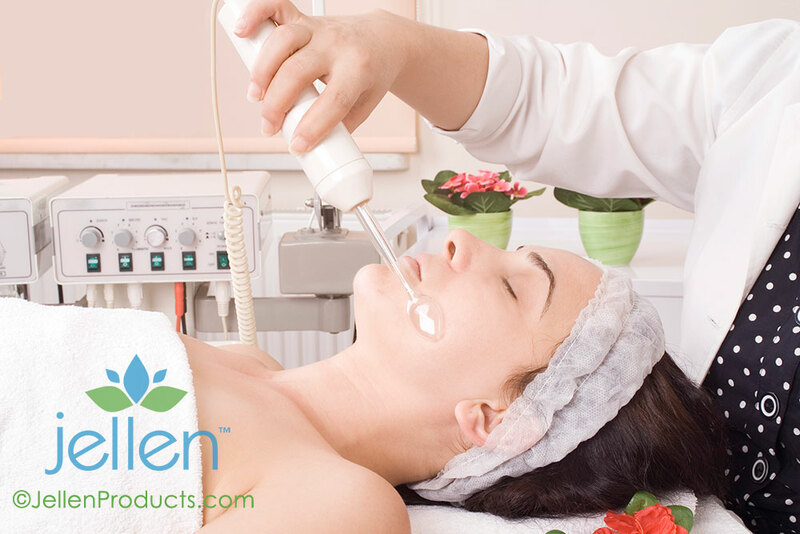 The best-selling professional-grade Jellen® Portable High Frequency Facial Machine which operates at an oscillating electrical current of up to 250,000 Hertz (cycles per second), is compact enough to use at home or in the treatment room where space may be limited. 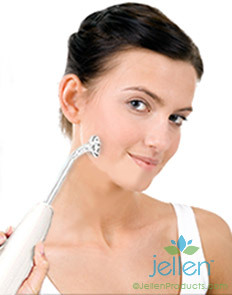 The Jellen® High Frequency Facial Wand and the OxyDerm High Frequency Facial Tool are examples of entry level devices that operate at an oscillating current of up to 100,000 Hz and are designed for those who are new to high frequency treatment. Also ideal for frequent travelers, these devices are lightweight and easy to use. They offer the convenience of portability for use at home and can be very effective when used in between spa visits or as part of one's regular skin care routine. *Important Treatment Guidelines: We do not recommend using any portable home high frequency system for more than 5-10 continuous minutes per treatment, per day. Using the system for extended periods of time, could lead to early coil burnout which could void the system's warranty. Limiting the use of the system to once per day is also a safe, recommended frequency of treatment as it allows your skin to properly process and benefit from the high frequency stimulus. Using the system more frequently, will not provide any incremental benefit. Spa and salon professionals should ensure that the portable high frequency machine is turned off for a minimum of 20-30 minutes in between individual client treatments. The first high frequency appliance was developed in the late 1800's by renowned scientist Nikola Tesla and was referred to as the Violet Ray. While it offers a number of functions, before the invention of 'modern' antibiotics it was largely used for medical purposes such as in the treatment of strep throat and other infections and to expedite the healing of wounds. French biophysicist Jacques-Arsène d'Arsonval also did early work in the area of electrotherapy. In 1892 he introduced the use of high frequency currents to treat diseases of the skin and mucous membranes. High frequency is traditionally referred to as "D'Arsonval high frequency" or the "Tesla current". In the 1970's, European salons discovered the cosmetic and healing benefits of high frequency electrical stimulation on the skin and by 1980, the the technology became widely used in North American by skin care professionals. Considered a very safe and non-invasive approach to skin rejuvenation, high frequency technology became quickly recognized by licensed aestheticians as the leading treatment for many skin conditions ranging from acne to wrinkles to hair loss. High frequency facial machines work in conjunction with high frequency electrodes which are made of clear tempered glass and come in a variety different shapes and sizes to facilitate the treatment of various contours of the face and body. When the high frequency electrode is firmly inserted into the high frequency hand piece, a gentle alternating electrical current is generated by the high frequency machine which then passes through the attached glass electrode upon contact with the skin. This contact ignites the inert gas within the electrode which produces healing electrical light energy and unstable oxygen which instantly converts into purifying ozone. In other words, when mixed with the air outside of the electrode, the electrical current infuses the skin with rejuvenating oxygen molecules and a therapeutic zapping or tingling sensation is experienced. Why Do Wattage and Oscillation Rates Matter? The power level and output strength of a high frequency machine is ultimately measured by the high frequency oscillation rate (measured in Hertz), NOT by the level of wattage! It is important to choose a portable high frequency facial machine that operates at a relatively LOW wattage level (anything less than 10 watts) and a high rate of oscillation (>100,000+ Hz). This optimal combination is a signal of efficiency in operation and output. 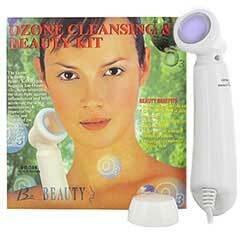 I have highlighted a list of recommended home high frequency facial machines above. A quality portable high frequency machine operating at a low level of wattage is more efficient at producing high frequency current, and will last much longer than inexpensively manufactured units running at higher levels of wattage. A portable high frequency machine operating at a HIGH level of wattage (10+ watts) can signal a red flag. Typically, such machines are not as efficient because they have to work very hard to generate the same electrical current output, and are much more prone to internal damage and early coil burnout due to overheating. Quality high frequency electrodes are typically made of tempered glass and filled with either 1) argon gas which produces a subtle violet colored glow, or 2) neon gas which produces an orange glow. The high frequency electrode acts as a safe conductor of the current. High frequency is a wonderful holistic treatment offering a host of benefits for many skin care concerns ranging from acne to wrinkles. Traditionally, the violet electrode is used by professionals to treat acne prone skin. An extremely small amount of ultra-violet light is emitted when the violet electrode makes contact with the skin. Such brief and low level UV exposure is considered very safe (non-skin damaging) and provides excellent anti-bacterial and healing benefits. The orange electrodes are generally indicated in the treatment of aging skin because they are said to direct more warmth to the treatment area which promotes blood circulation, encourages cellular turnover and improves product penetration. Sometimes the body can become immune to certain acne medications if used over an extended period of time. When combined with an effective acne treatment lotion, regular application of high frequency keeps the acne away long after other expensive medications and treatments can fail. High frequency gently cleanses the skin of acne-causing bacteria and unwanted toxins while making the skin more receptive to acne lotions, creams and other skin treatment products. The results can be extremely dramatic - even after only a few treatments! Try to select an acne product that is effective yet gentle on the skin such as Clear Skin Acne and Scar Solution. My personal favorite has always been ProActiv's 3-Step System which uses a specially formulated blend of micro-crystal benzoyl peroxide to attack the acne cycle to clear current blemishes and help prevent new ones from forming. I like these systems because they are effective in combination with high frequency yet gentler on the skin and do not not cause excessive redness. Many of our clients have reported excellent results using these two lines of acne topicals together with our Jellen High Frequency Wand and our Jellen Professional-Grade High Frequency System (for licensed professionals). With regular use, high frequency facials can be quite effective at reducing the size of enlarged pores, softening skin, controlling excess sebum production and eliminating the occurrence of blackheads. The gentle spray of oxygen molecules produced by the high frequency current diminish enlarged pores by penetrating deep down into the root of the affected area and cleaning out unwanted debris and toxins allowing the pore to quickly regain its natural size once again. I have found that the best products to use in conjunction with high frequency treatment to help shrink down large pores are clay or mud masks. Oshi Glows makes an excellent healing Facial Clay Mask that contains gentle ingredients such as Bentonite & Kaolin in addition to ocean mineral rich kelp and spirulina to reduce inflammation and irritations and give your skin a healthy, radiant glow and Pure Body Naturals offers a best-selling Dead Sea Mud Mask product that as it dries, pulls out the toxins and excess oils from the skin and helps shrink down the size of your pores. The oscillating action of high frequency can increase blood circulation, which in turn nourishes the skin's surface and renews underlying cells. It also produces an enriched form of oxygen, which can provide the skin with a firm, youthful, vibrant glow. It can diminish the appearance of fine lines and wrinkles, tighten double chins and jowls and improve overall skin texture and tone by promoting increased collagen production. Be sure to follow up treatment with a high quality, organic topical such as Jellen® Organic Hyaluronic Acid Illuminating Serum which contains natural brighteners and other organic ingredients to help even out skin tone, improve texture and restore elasticity and suppleness to dry, aging skin by reinforcing the skin's protective barrier function. This serum is also ideal for those with combination or acne-prone skin as it is non-oily, easily absorbing, light-weight does not clog pores and contains a host of skin calming organic botanical extracts. Through its rapid oscillation, high frequency current improves the process of nourishment, gently exfoliates the skin, promotes local blood circulation, stimulates local glandular activity, supplies heat to the area which is soothing to the nervous system and significantly improves the scalp's receptiveness to and the overall effectiveness of post-treatment hair growth formulas. For many years, hairdressers have used high frequency current technology to revitalize scalp conditions which can aid in promoting healthier hair growth. For more on hair loss solutions, please see: 6 Natural Ways To Stimulate Hair Growth. It is important that any high frequency facial machine operating at over 5 watts offers a three-pronged power supply plug. The third grounding pin is a critical safety feature that prevents against the risk of shock to you or damage to your high frequency facial machine during operation. Superior quality portable high frequency machines will offer a three-pronged power plug for safety. Never operate the high frequency system with a broken bulb. Do not use outdoors, near water or around combustible substances.